A Bottlenose Dolphin, the most well known type of dolphin. Dolphins are mammals in the order Cetacea. They are part of the toothed whales. Generally, they are among the smaller whales. Most live in salt water oceans, but some live in rivers – there are oceanic dolphins and river dolphins. Dolphins are from 1.5 metres (4.9 ft) to 4 metres (13 ft) long, but the largest dolphin, the killer whale (or orca), can be up to 8 metres (26 ft) long. The name 'dolphin' comes from the Ancient Greek δελφίς (delphis) meaning "with a womb", because it was first thought to be a fish with a womb. It is now known to be a mammal, and quite an intelligent mammal. Dolphins breathe air. A dolphin's nose is on top of its head so the dolphin can easily breathe on the surface of the water. The skin of a dolphin has no scales. It is soft and smooth. However, it is very firm, due to how much muscle they have. Dolphins use echolocation to find their food. Dolphins swim in 'pods'; a very large pod is called a herd. They are very social and help each other fight off predators. Dolphins have fought off sharks in this way. They can kill large sharks by ramming them over and over again with their snouts and heads. They look after the young, when the mothers need to leave their calves to hunt for food. The young need to breathe more often than the adults, and the food may be in deeper waters. Oceanic dolphins are marine animals living in the sea. They live in all of the oceans. Three of the four species of river dolphins live in fresh water rivers. The La Plata Dolphin lives in saltwater estuaries and the ocean. Water pollution and the loss of habitat are a threat to some dolphins, especially those living in rivers and estuaries. Dolphins do not sleep in a normal way. They have two sides of their brain, which they use to sleep. One side sleeps, while the other side stays awake. They will keep one eye open to watch for predators while they sleep. Dolphins also swim in circles when they are sleeping with the outer eye open to watch out for danger. Dolphins (and other cetaceans) sleep in the water. There is danger from sharks. While sleeping in water, the animals go through different stages of sleep. They do some behaviours during sleep: they come to the surface occasionally to breathe, and they have an eye open most of the time. The details vary in different species or groups. Predator detection is the obvious function of this behaviour. Similar adaptations are found in pinnipeds like seals. The brain of a dolphin is like a human brain in size and development. Dolphins have reasonable eyesight. They can watch a thing in the water, and they can see colors, too. They can also see in dark places. A dolphin's hearing is better than their sight. There are small holes behind the eyes, and they are the ears of a dolphin. Dolphins can hear a sound underwater. They can know the direction of the sound very well. 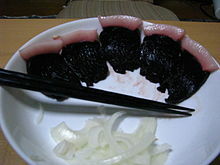 Dolphin meat is eaten in a few countries, including Japan and Peru (where it is referred to as chancho marino, or "sea pork"). Japan may be the best-known and most controversial example, but eating dolphin is not that common. Dolphin therapy is sometimes used for people with mental or physical handicaps. It involves contact with trained dolphins. It is not agreed whether this is any better than the usual treatments. Scientists continue to study dolphin therapy. Wikimedia Commons has media related to Delphinidae. ↑ 1.0 1.1 1.2 Lyamin et al 2004. Relationship between sleep and eye movement in cetaceans and pinnipeds. Archives Italliennes de Biologie 142: 557–568. ↑ "Taras". Retrieved 3 October 2010. ↑ McCurry, Justin (2009). "Dolphin slaughter turns sea red as Japan hunting season returns". The Guardian. London. Retrieved 24 May 2010. ↑ Lori Marino, Scott O. Lilienfeld (2007). "Dolphin-Assisted Therapy: more flawed data and more flawed conclusions" (PDF). Anthrozoos 20 (3): 239–49. doi:10.2752/089279307X224782. http://www.marineconnection.org/docs/DAT%20Paper%202007.pdf. Retrieved 2008-02-20. This page was last changed on 17 September 2018, at 11:34.